For other uses, see Ardrossan. 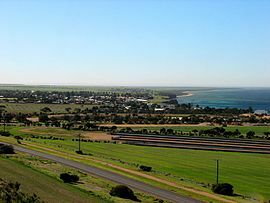 Ardrossan is a town in the Australian state of South Australia located on the east coast of the Yorke Peninsula, about 150 kilometres (93 mi) by road from the Adelaide city centre, It is notable for its deepwater shipping port and its towering coastal cliffs of red clay. The indigenous owners of the area of which Ardrossan was developed were the Narungga. The first European settlers were pastoralists who established sheep runs. Pastoral Lease No. 232, comprising 27 sq. miles, was taken up in 1852 by William Sharples. Stretching along the coastline, this was known as Parara (or Parrana/Pirana), meaning 'middle' in the Narungga language, with the homestead near Parara Landing, about three kilometres south of present Ardrossan. Northward of Ardrossan are coastal springs, named Tiddy Widdy or Tittiwitti by the Narungga, being a scarce natural source of fresh water in this region. In 1859 partners Parker Bowman (1831-1911) and Edmund Parnell (c.1834-87) took over the Parara leases. After these expired in 1865 the government moved toward establishing closer settlement and grain farming. The Hundred of Cunningham was proclaimed 19 June 1873, comprising 134 square miles, and surveying commenced. The Hundred had two government surveyed towns, namely Ardrossan, proclaimed 13 November 1873, and Price, proclaimed 3 August 1882. Being at a site formerly known as Clay Gully, after a deep gully leading to its red clay coastal cliffs, the surveyed town of Ardrossan was named by Governor Fergusson after the Ardrossan seaport in Scotland which shared similar geography - 'ard' a height, and 'ros' prominent rock or headland. The site was largely chosen because of its potential for shipping infrastructure, allowing wheat farmers to ship their produce across the Gulf St Vincent to Port Adelaide. The residents of the new township petitioned the government for a jetty in 1874. Completed in 1877, this was later extended to better accommodate the larger steamships and windjammers used to export grain overseas. By 1878 there were six houses, a post office, a flour mill, a Methodist church, and a hotel. That same year a public school opened, having 53 pupils. During the late 1800s, and into the early 20th century, the town expanded steadily due to income from the surrounding farms. As well, it became notable as the location of Clarence Smith's factory where he manufactured the Stump-jump plough between 1880 and 1935. This South Australian invention was vital in opening mallee country throughout Australia to the plough. Although the surrounding grain farmers continued to prosper, there was little change in the size of the town during the early 1900s. Indeed, after the depression in the 1930s, the town and its businesses were largely stagnant until a large open-cut dolomite mine was opened by the Broken Hill Proprietary Company (BHP) in the 1950s for use in its steel manufacture at Whyalla on the Eyre Peninsula and Port Kembla in New South Wales. A new one kilometre (3,300 ft) long jetty was added and at the same time construction was started with grain storage silos. The 'new' jetty currently services ships loading dolomite, grain and salt from the solar salt pans at Price which are located approximately 10 km (6 mi) north. The wharf is located 1.5 kilometres south of the town jetty, and can accommodate vessels of Handymax class. The wharf is being considered for the future export of iron ore and copper concentrates by Rex Minerals Ltd.
Ardrossan today is in the local government area of Yorke Peninsula Council, the state electoral district of Narungga and the federal division of Grey. The coast and water bodies of Ardrossan support populations of water-fowl, sea and shorebirds and support migratory waders during their summer visitations. Fishing, including the trapping of blue swimmer crabs is a popular pastime for local residents and visiting holiday-makers. South Australia's only recorded group stranding of sperm whales occurred on Parara Beach about 4 kilometres (2.5 mi) south of Ardrossan on 8 December 2014. Seven dead or dying whales were discovered stranded in the intertidal zone south of the BHP jetty. Six of the whales were located in a loose group along several hundred metres of shoreline, with another whale located further to the north. The South Australian museum announced that it would sample the bodies and attempt to collect a complete skeleton for the museum, commencing work on December 10. Biopsy samples were formally taken from five of the whales by Australian Marine Wildlife Research & Rescue Organisation (AMWRRO) for analysis on December 9. AMWRRO rejected the proposition that any whales featured propeller strike marks, claiming that the marks they observed were tooth raking marks, resulting from behavior more commonly known to occur among orcas. Several teeth were illegally removed from the animals overnight on December 8. Grain farming and pastoralism continue to be a mainstay of the local economy. The existing dolomite mine and jetty are currently owned and operated by Arrium (formerly Onesteel). Today, tourism plays an increasingly large part in Ardrossan's economy with the town being a popular destination for Adelaide residents on weekends. While it lacks an attractive swimming beach, it is a popular location to catch fish and blue crabs which are abundant during the months of September through April each year. The town's two jetties are also suitable for scuba-diving, with easy entries and plentiful marine life to observe. The historic shipwreck of the Zanoni is located approximately 15 miles offshore and is a popular scuba diving location. This ship originally sank on 11 February 1867 and was discovered on 17 April 1983 after 116 years. It is one of the best preserved examples of 19th century merchant sailing vessels in Australia. The Ardrossan News (3 February - 7 July 1911) was briefly printed for the town by Thomas Corrigan in Port Wakefield. Ardrossan, like most of the Yorke Peninsula, has a maritime climate. Summers are warm and winters are mild (although they can be cool) and usually wet. ^ Australian Bureau of Statistics (31 October 2012). "Ardrossan". 2011 Census QuickStats. Retrieved 26 February 2016. ^ "Monthly climate statistics: Summary statistics PRICE". Commonwealth of Australia , Bureau of Meteorology. Retrieved 25 February 2016. ^ a b "New Ward Structure 2014". Yorke Peninsula Council. Archived from the original on 15 January 2016. Retrieved 21 October 2015. ^ Lodge, Barbara, and Zirkle, Connie : Ardrossan School 1878-1978 (Adelaide 1978) ISBN 0959616306. ^ Ardrossan Archived 25 February 2014 at the Wayback Machine SA Memory. Retrieved 2014-01-06. ^ Rex Minerals Ltd Hillside Copper Mine Information Sheet Archived 10 November 2013 at the Wayback Machine Retrieved 2013-11-13. ^ Marnie O'Neill (8 December 2014). "Pod of sperm whales found beached near Ardrossan on the Yorke Peninsula in South Australia". News.com.au. News Limited. Retrieved 9 December 2014. ^ "Whale carcasses could be left to rot on SA beach after mass stranding". ABC. 9 December 2014. Retrieved 10 December 2014. ^ a b Machado, Aaron (9 December 2014). "Sperm whale samples taken by AMWRRO". AMWRRO. Retrieved 10 December 2014. ^ Broadstock, Amelia (9 December 2014). "Mystery over why seven sperm whales beached themselves at Ardrossan". The Advertiser. Retrieved 10 December 2014. ^ Community Directory - Ardrossan Archived 24 December 2013 at the Wayback Machine Retrieved 2013-11-10. ^ "South Australian Shipwrecks - The Zanoni" Government of South Australia, Department of Environment & Heritage (2000-08-09). Retrieved 2014-01-06. ^ Laube, Anthony. "LibGuides: SA Newspapers: A-B". guides.slsa.sa.gov.au. Retrieved 28 August 2018. Wikivoyage has a travel guide for Ardrossan (South Australia). Wikimedia Commons has media related to Ardrossan, South Australia. This page was last edited on 18 January 2019, at 11:27 (UTC).